These days kids are seeing what they shouldn't, i mean they are yet to learn many things, but they waste their precious time online doing useless thing such as online chatting and etc. Which can endanger the future of a child. Finding good sites for a kid is quite difficult, because you aren't yet sure what the site is exactly and what information they ask the kid for, that's what puts you in tension. So what now ? Leave your kid to do whatever online ? No you can't compromise with this at all. Sonic TV is a TV channel is totally safe for a kid to see and can enjoy it. It plays old and classic kids shows such as Are you Afraid of the Dark, Kung Fu Panda, Power Rangers and more shows from which any kids can learn something good, and that's what the most important, learning. Shaktiman used to be the only show we watched on TV, nowadays even cartoons aren't safe for children as the shows uses inappropriate language that's not good a kid at all. Shaktiman, is a great show that's teach us to fight with the evil and save the truth and if your kid watch this they will understand and always take side of truth, these shows gives us moral teaching and it's very important for a kid to learn. 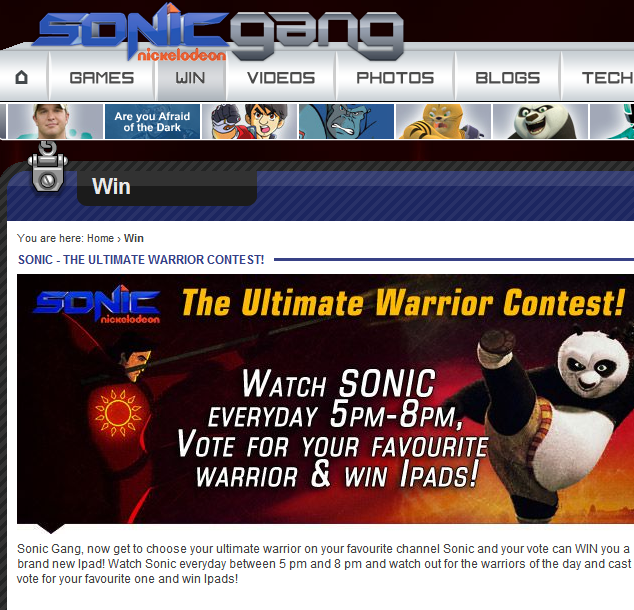 Contest is a good way to keep kids engaged with the site and learn more, there are many good competition on Sonicgang.com for kids and also teenage like me, because everyone likes to play competition and they giveaway iPads and other gadgets as awards. So it's safe for kids and the kids may use sonicgang.com to find kids with similar interest and interact with their whole new world on sonicgang.